(ง ͡ʘ ͜ʖ ͡ʘ)ง ヽ(ﾟДﾟ)ﾉ (ó﹏ò｡) Best lenny faces, text faces, text emoji, Kaomoji and Japanese Emoticons (ASCII) no need to generate one click copy options. WHAT IS THE MEANING OF LENNY FACE? Lenny faces emotion or says text face used in many ways like it represents Mischief mood and also used in spam activities. It does not require any category to use. You are free to use it anyway. WHAT IS THE ORIGIN OF LENNY FACES? First of all Lenny's face has another name it is also called deg deg face. According to the dictionary, this Lenny's face has first time appeared on image-based message board Ylilauta on November 18, 2012. And its title was "( ͡° ͜ʖ ͡°) this thread is leaking from the heavens.". On the same day, a video is also uploaded on YouTube with this ( ͡° ͜ʖ ͡°) face title and inside the video. the only thing was that the text was zooming up and down and with the soundtrack of equivalent is screaming, within some days people start calling this emoticon with name Lenny face and Le Lenny Face. People thought this was going to disappear, but it's still not gone, lots of people using this text face in their everyday online activity. WHAT IS THE USE OF LENNY FACE (TEXT FACE)? You can use this text faces to describe your mood on whether it's messaging, facebook, twitter or any other social perform. HOW TO USE THESE LENNY FACES? Using these Lenny's faces are very easy you have to click on any text face which you want to use, it's automatic going to copy on your clipboard and then paste where ever you want that's it. 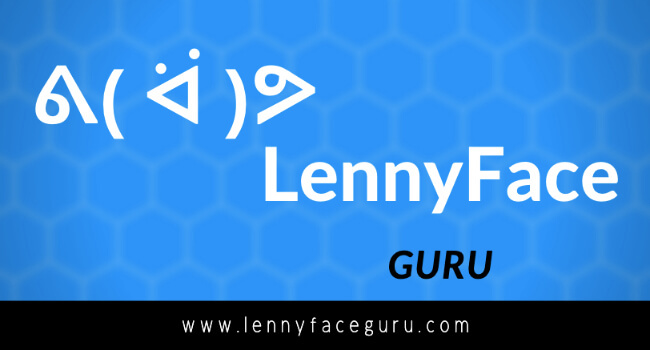 And one more thing our LennyFaceGuru.com is one of the best websites for Lenny's faces or Text faces because we have designed our site so user-friendly, result the user can easily use that it. Its remember your recent used Lenny face and text faces.